Things have been busy lately at the PRHI factory, and I have been dying to show off what I’ve been working on. I didn’t want to start revealing these too early, but now everything is ready and the PRHI Shapeways Shop has been updated so you can dig in! Astromech droids are one of the most iconic aspects of the Star Wars franchise and Kenner clearly recognized this early on, releasing more versions of the venerable little R2-D2 figure than almost any other character. Astute viewers of the original films will be able to spot loads of different Astromechs, and the modern Hasbro line is rotten with obscure variants. For vintage Kenner collectors, the options are a little more limited. There are plenty of beat up old Kenner R2s and R5s out there that could be customized, but they have a certain charm in their well-loved, beater form. Now you can whip up any custom Astromech you can think of with the PRHI Astromech Kit available from Shapeways. This kit mimics the original Kenner R2/R5 toy design, but with modern COO markings for easy identification. PRHI Astromech Kit parts are even compatible with vintage parts for repairs, and the PRHI droid’s head clicks when turned just like the original. Grab a kit in any color you like and whip up a sticker to complete the look. Thanks to all the options Shapeways has, you can make a whole slew of different colors droids, and even make a clear-domed R3 model using the R2 head printed in Frosted Ultra Detail. You can get your R2’s head printed in Stainless Steel for a more rugged look that I’m rather partial to. Also available are some options not made by Kenner, specifically the R4 head, the R5-D4 Prototype sculpt head from the same early catalog as the PRHI Power Droid Prototype Kit, and now you can finally complete your Jabba’s Palace scenes with a 3D printed R2 Drink Tray! The Drink Tray is an especially fun project, and is compatible with vintage toys and the PRHI Astromech Kit. The Drink Tray fits on without any modification to your toy, and looks great with a quick paint job. Not too detailed, just the way Kenner would have done it. All of these goodies are available now through Shapeways! I’ve been whipping up custom Astromechs like mad using some custom stickers I got off ebay. These are going to be all over my vintage display once it’s set up. I’ve got a whole spread of new offerings up on the PRHI Shapeways Shop today! There’s a little bit of everything here, replacement parts (marked for easy identification), upgrade parts, and even an entire new PRHI toy kit! First up is something I’m really excited about, a complete toy kit to enhance your vintage Kenner Star Wars collection. 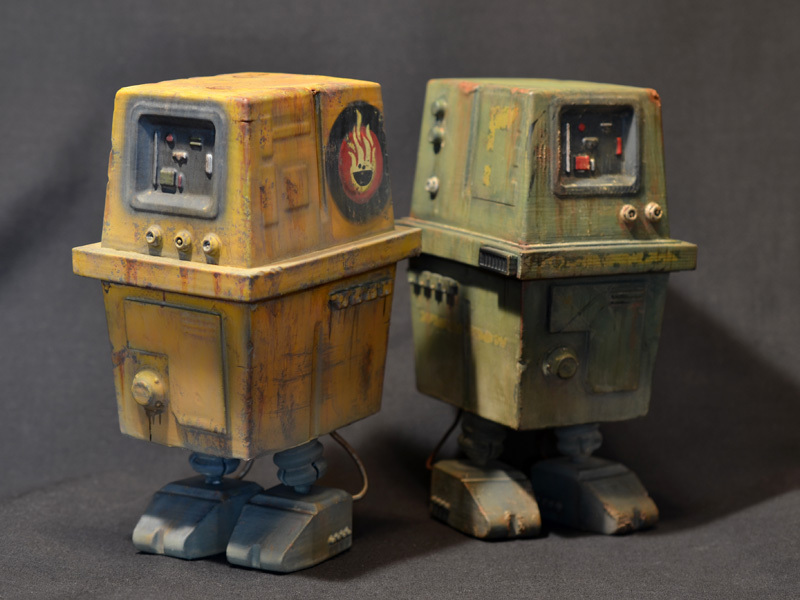 This complete vintage-style Power (Gonk) Droid kit is based on an early prototype sculpt shown in a German catalog (pic on SWCA). The prototype is in the hands of a collector, so there is plenty of reference to make a kit version. The PRHI Proto Gonk kit is supplied in two parts (Body and Leg Sprue), and is available in any color you like. I recommend a nice bright color for the body and black for the legs and antenna. The kit can be assembled without glue, but I would recommend using some on the little antenna for security. You will need to provide your own sticker for the face, and paint up the feet. The finished figure is articulated at the legs. Next up are two highly requested accessories for your Star Wars Black 6″ figures, the DLT-19D heavy blaster rifle and DLT-19X Sniper model. These are perfect for outfitting your specialist Imperial troops or Battlefront-inspired customs. Both are available in Black Strong Flexible and Premium Black Strong Flexible. I recommend the Premium finish, pictured above. It’s a bit more expensive but makes a huge difference on the finished blaster. Another new blaster available is this pistol for your vintage Boba Fett. This pistol is accurate to the early version of the costume used to design the Kenner figures, and matches the blaster included with the Kenner large sized Boba Fett. Again, available in Black Strong Flexible and Premium Black Strong Flexible, and I recommend the Premium finish. After that are some new replacement parts for your vintage toys. All of these are clearly marked with a PRS logo on each part for easy identification. First up are accessories for Sy Snootles and the Max Reebo Band, performing exclusively for Jabba the Hutt! Both the skinny and thick microphone stands and the flute are available separately, each in Premium Black and metallic finishes. Last, some accessories for your Kenner large sized Darth Vader and Stormtrooper. You can order a lightsaber hilt for your Darth Vader 15″ figure, sized to fit a 0.187″ diameter acrylic rod for the blade. Also up are two styles of Stormtrooper blaster, both as a solid sculpt and the toy-accurate version with lightening holes to save on material. The Kenner large size figures are terrific toys, available for quite cheaply. These accessories are perfect to complete those well-loved Vaders and Stormtroopers you see at every toy show. Thanks to everyone for your continued support of these projects! If you order something and take a pic, tag me on Instagram! The newest PRHI 3D printed toy was inspired by a sketch done by Minoru Sashida, Head Art Director at Namco Bandai and longtime Microman expert. 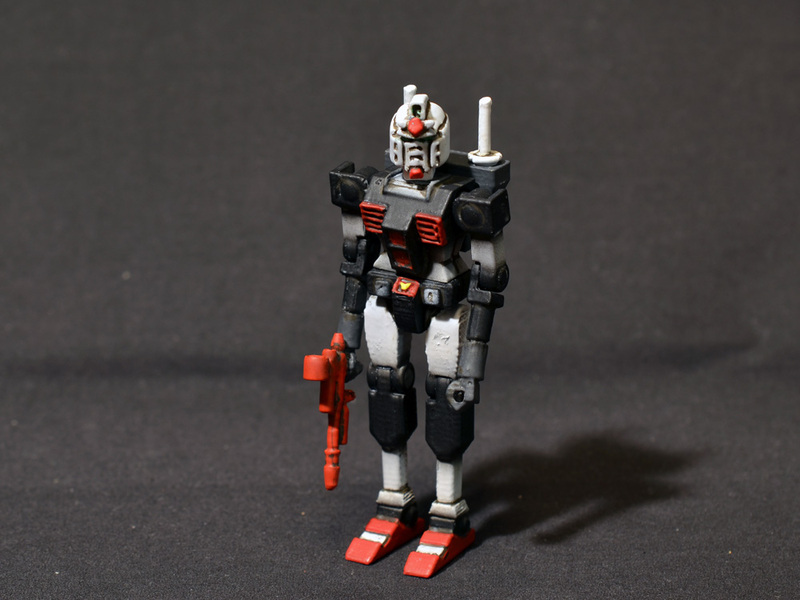 Sashida-sama had envisioned the RX-78-2 Gundam in the style of other robots released as diecast figures in the Microman line, such as Kotetsu Jeeg (鋼鉄ジーグ) and Magnerobo Gakeen (マグネロボ・ガ・キーン). 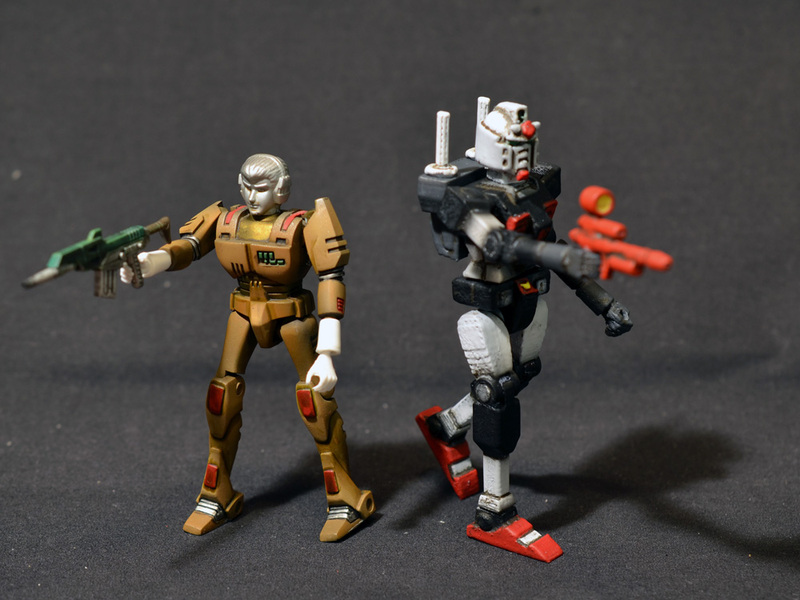 These diecast figures came about because the original toys for both series were made by Takara, so they were able to release these characters under the Microman banner as well. Sashida-sama’s illustration is a ‘what-if’, rendering the Gundam in the same style as the other Micro robot diecasts. I loved the drawing, and could immediately see how well it work would as a real toy. I started with that sketch and ended up here, with a fully articulated Micro-sized Gundam. I worked in the mecha’s classic accessories, as well as some design inputs from the original Clover toys that were released alongside the anime. For the Micro Moving Mecha’s (MMM) debut, I had to go with the iconic black and white RX-78-1 Prototype paint scheme. This fully painted one-off debuted at FOE Gallery’s LOOK5 show and will be available on their site here if it hasn’t sold yet: Shop FOE Store. The first regular release of the PRHI MMM is in the works, and will be a printed in color version in blue and silver to look like a diecast metal figure. Stay tuned for details! Here’s the PRHI MMM alongside a Real Type Micro buddy! Interstellar was one of the tent-pole sci-fi movie releases of 2014. The actual movie seemed to get mixed reviews (I dug it), but there was one thing everyone could agree on: the companion robot design was incredible! The robots just about stole the movie, delivering the humor of R2-D2 and C-3PO with the intonation of HAL 9000. To boot, they featured a phenomenal mechanical design, able to solve a variety of problems in straightforward, real-world ways. I went home after the movie convinced that I could make a working toy of the design and got to work. The alluring thing about the robots TARS and CASE (and KIPP!) is the way their blocky bodies can reconfigure along a couple of axes. For a big, DX style toy of the bots, I knew I wanted to be able to move parts along two axes seamlessly, which meant using magnets. The end result is a little complicated and awkward, like the real thing, but it does work! I made this first version in 1/12 scale to go alongside my 6″ figure collection. I’ll be offering a smaller, 3 3/4″ scale version for sale in the near future, so check back here or follow me on Twitter and Instagram for news! 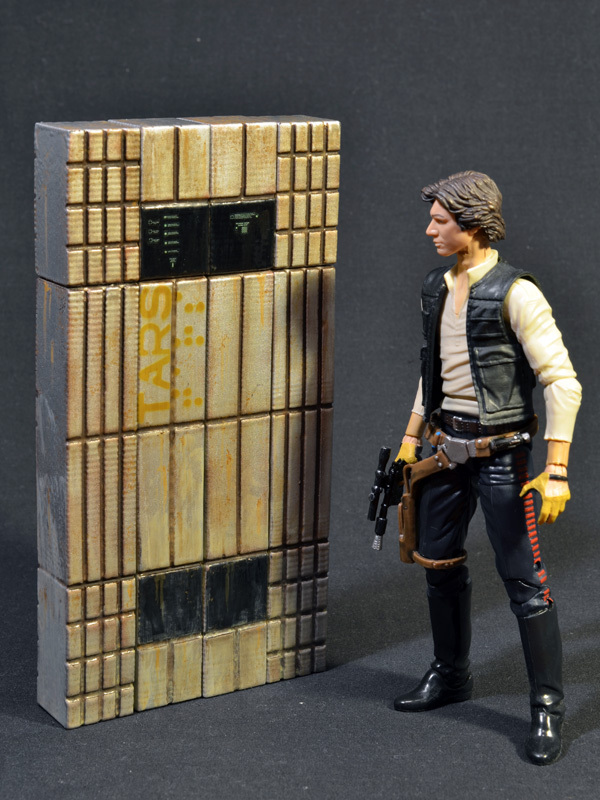 Here’s a shot of TARS alongside Star Wars Black 6″ Han Solo for scale. 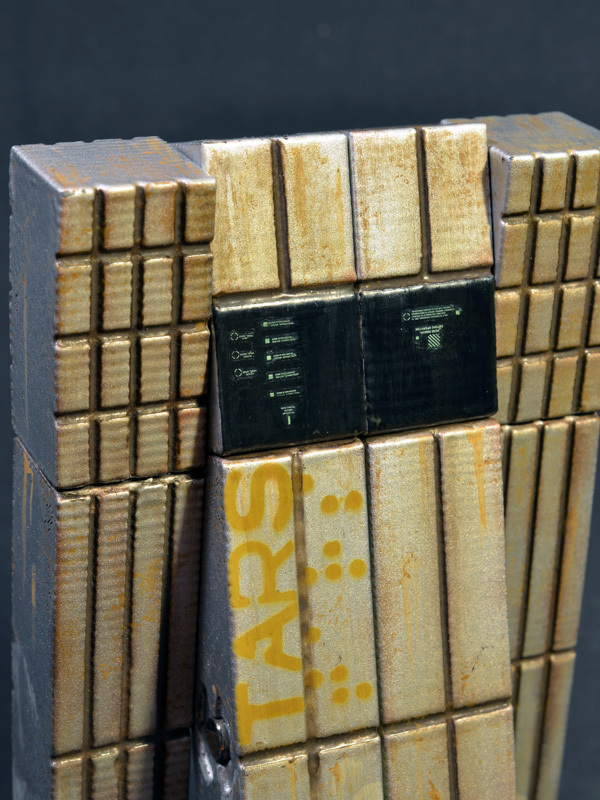 TARS is painted with Vallejo alcohol-based metallics for a smooth finish, and detailed with Monster Kolor and acrylics. I did the ‘face’ screen displays with waterslide decals, tinted with clear green paint. The name and logo were painted on using a 3D printed spray mask. 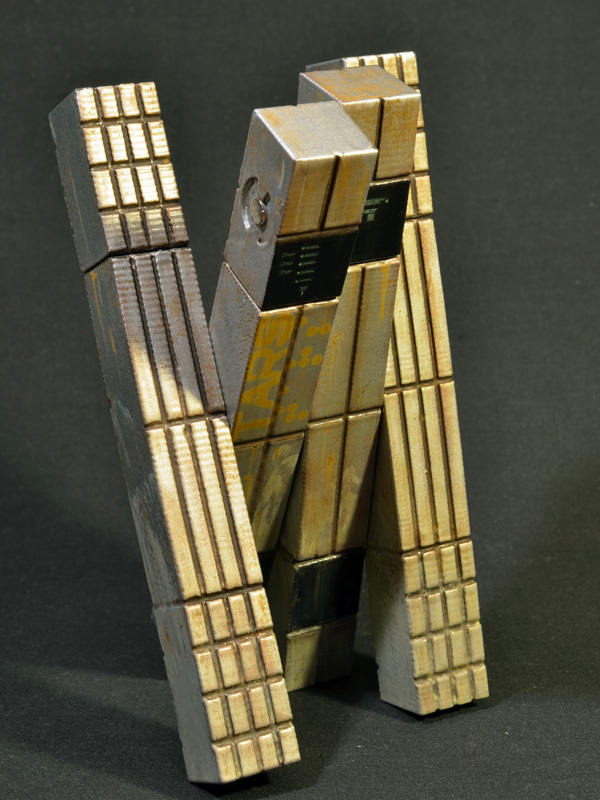 TARS in motion! Check after the jump for lots more photos. This guy finally made it across the country to the guys at Tested.com so I can show him off. I’ve been a fan of the Tested crew for years, so I wanted to send them something as a small thanks for all their years of awesome content. Fortunately they are fans of making stuff, 3D printing, and Star Wars. All things I can contribute! Thanks to the Tested guys for the awesome mailbag vid and website shout out. This Gonk Droid features a few tweaks over the first green one I did that help with printability, as well as some better detail on the (not printed) leg wires. I also took the opportunity to try out something I’ve been thinking would work, a 3D printed paint mask! Testedcles is the old Tested logo, and I really wanted to work him onto the droid for them. I traced the logo in my modeling software and made it a cutout in a thin slab of plastic that worked perfectly as a spray mask. 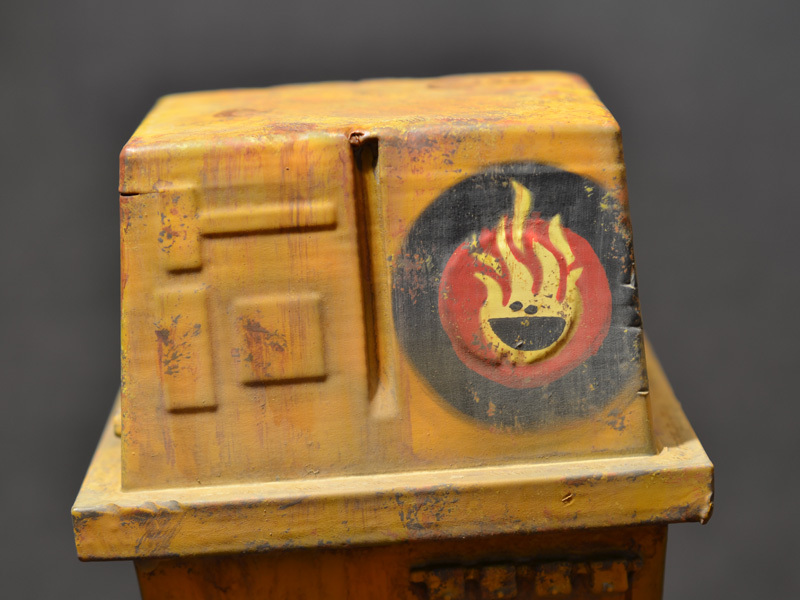 After a few different coats of weathering, any remaining sins, and my orange Gonk Droid was good to go! I’ve been collecting a lot of Star Wars toys lately, and one of the things I was most excited to get was the latest version of Hasbro’s big X-wing. Amazingly enough, the modern X-wing mold’s origin can still be traced back to 1998’s Power of the Jedi 2 Electronic Power F/X X-wing mold. I remember seeing TV commercials for the Power F/X toy back in the day, but never had one. 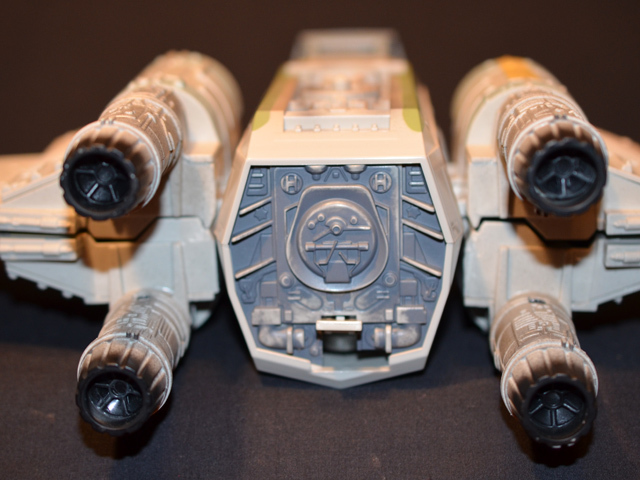 The mold has gone through a number of revisions, but the bones are still the same in today’s X-wing toy. I was thrilled to get a big new X-wing toy, but I was incredible disappointed by the S-foil deployment gimmick when I finally put the toy together. Out of the box, the wings are saggy, loose, and do not deploy evenly. I figured the mechanism could not be that complicated, so I cracked open my new X-wing and got to work. The jist of the mechanism is a lever that depresses a spring-loaded plunger that deploys the wings. The level slides to the side to lock in place, but when slide to the side the lever does not depress the plunger evenly or far enough, so the wings are uneven and floppy. I fired up the computer and designed a new piece and printed it on my 3D printer, going through a half dozen iterations in a weekend until I had a new piece that held the plunger all the way down evenly when locked in place. The ABS plastic part printed on my UP Mini was good enough for me, but not something I was interested in making a number of for others. 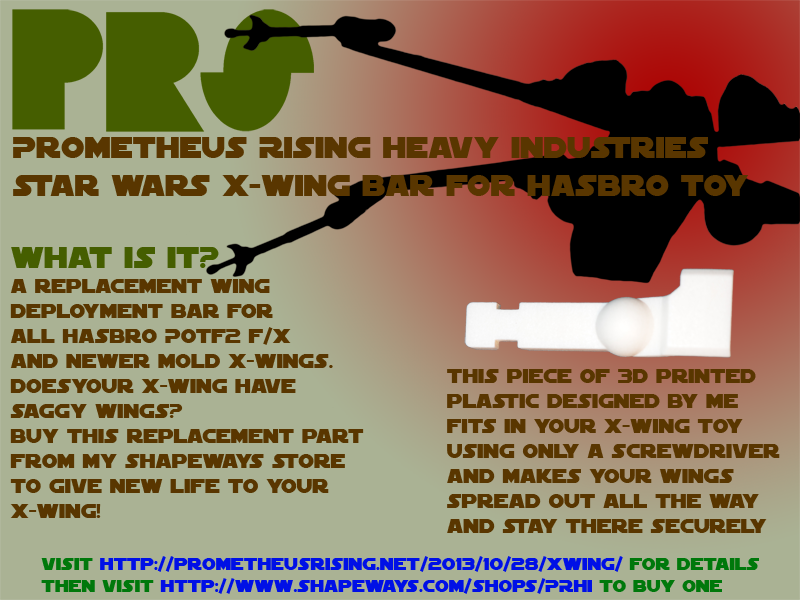 Instead, I ordered a couple of test prints from Shapeways and found the best one, which is available now in my new Prometheus Rising Heavy Industries Shapeways Store! I may use Shapeways to offer some of my own toys in the future, but for now it is the home of my first third-party toy add-on part. Keep reading after the jump for details on the development, installation, and end result of my X-wing bar. Reorganized some shelves while waiting for new arrivals. 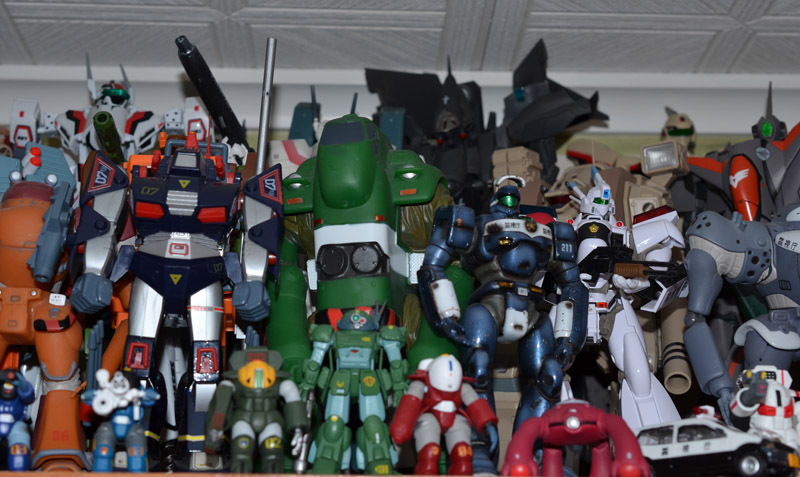 Here’s my 1/60 scale mecha lineup, featuring Macross, Dougram, Dorvack, Patlabor, Votoms, Gundam, and Mospeada. Basically, all of my favorite things. Click the top image for a bigger panorama.